Much research can be done about the genesis of the pre-tribulation rapture doctrine. Most studies lead to it not being widely recognized in the church before the 1800’s. This can be debated, but the Bible itself has much to say about the end times. Dan.7:24-25 And the ten horns out of this kingdom are ten kings that shall arise: and another shall rise after them; and he shall be diverse from the first, and he shall subdue three kings.25And he shall speak great words against the most High, and shall wear out the saints of the most High, and think to change times and laws: and they shall be given into his hand until a time and times and the dividing of time. Luke 21:7-19 And they asked him, saying, Master, but when shall these things be? and what sign will there be when these things shall come to pass?8And he said, Take heed that ye be not deceived: for many shall come in my name, saying, I am Christ; and the time draweth near: go ye not therefore after them.9But when ye shall hear of wars and commotions, be not terrified: for these things must first come to pass; but the end is not by and by.10Then said he unto them, Nation shall rise against nation, and kingdom against kingdom:11And great earthquakes shall be in divers places, and famines, and pestilences; and fearful sights and great signs shall there be from heaven.12But before all these, they shall lay their hands on you, and persecute you, delivering you up to the synagogues, and into prisons, being brought before kings and rulers for my name’s sake.13And it shall turn to you for a testimony.14Settle it therefore in your hearts, not to meditate before what ye shall answer:15For I will give you a mouth and wisdom, which all your adversaries shall not be able to gainsay nor resist.16And ye shall be betrayed both by parents, and brethren, and kinsfolks, and friends; and some of you shall they cause to be put to death.17And ye shall be hated of all men for my name’s sake.18But there shall not an hair of your head perish.19In your patience possess ye your souls. Math. 16:25-26 For whosoever will save his life shall lose it: and whosoever will lose his life for my sake shall find it.26For what is a man profited, if he shall gain the whole world, and lose his own soul? or what shall a man give in exchange for his soul? Math. 10: 28 And fear not them which kill the body, but are not able to kill the soul: but rather fear him which is able to destroy both soul and body in hell. We have no need to fear being in the world, during the Great Tribulation. Many unsaved, will apparently come to accept Jesus as their Lord and Savior, at this time. Revelations 7:13-14And one of the elders answered, saying unto me, What are these which are arrayed in white robes? and whence came they?14And I said unto him, Sir, thou knowest. And he said to me, These are they which came out of great tribulation, and have washed their robes, and made them white in the blood of the Lamb. Perhaps we can be used in a simple, or a mighty way, to bring the lost to know Jesus. Peter was the apostle to the Jews, and Paul to the Gentiles, yet both were martyred for their beliefs, and for spreading the Good News of Jesus . Mathew5:11-12 Blessed are ye, when men shall revile you, and persecute you, and shall say all manner of evil against you falsely, for my sake. 12Rejoice, and be exceeding glad: for great is your reward in heaven: for so persecuted they the prophets which were before you. We are told by Jesus to rejoice, and be exceeding glad, if we are persecuted for Him! The Great Tribulation will be a time, when true Christian’s are persecuted for their beliefs. Revelations 6:10-11And they cried with a loud voice, saying, How long, O Lord, holy and true, dost thou not judge and avenge our blood on them that dwell on the earth?11And white robes were given unto every one of them; and it was said unto them, that they should rest yet for a little season, until their fellow servants also and their brethren, that should be killed as they were, should be fulfilled. Revelations 12:11And they overcame him by the blood of the Lamb, and by the word of their testimony; and they loved not their lives unto the death. Here in Revelations chapter 6 we read that a number of fellow servants, and brethren, will be killed at the end time, as had been done during an earlier church period. Also in chapter 12 it states, those that overcame Satan loved not their lives unto death. Revelations 13:7-8 7And it was given unto him to make war with the saints, and to overcome them: and power was given him over all kindreds, and tongues, and nations. 8And all that dwell upon the earth shall worship him, whose names are not written in the book of life of the Lamb slain from the foundation of the world. The Beast will be worshiped by the whole world, by everyone except those that have their names written in the book of life of the Lamb. Those that refuse to worship the Beast or anti-Christ? He will make war with them and overcome them. The same language is used concerning the Two Witnesses. Revelations 11:7 7And when they shall have finished their testimony, the beast that ascendeth out of the bottomless pit shall make war against them, and shall overcome them, and kill them. It is quite possible that as Christians, we will be martyred for our witnessing of the truth, and grace, that is our Lord Jesus. Isaiah 57:1-2 The righteous perisheth, and no man layeth it to heart: and merciful men are taken away, none considering that the righteous is taken away from the evil to come. 2He shall enter into peace: they shall rest in their beds, each one walking in his uprightness. ← The music industry, and the occult. If you can find a copy David Chilton’s commentary on The Revelation; Days Of Vengeance usually I’m not into a lot of heavy duty theology, I love the simple message of Christ pure and very simple, but Chilton will challenge your thinking on end times and the way most of the Church views the end times. For me I’m not waiting for a rapture or a someday earthly political Kingdom, i believe the Kingdom is a moral, ethical, Kingdom that Indwells us as believers; the Kingdom is in the Spirit (Rom. 14:17). Chilton’s book can be downloaded in it’s entirety off the old ICE forums site. It’s really I think the best commentary I’ve ever picked up. Thanks for checking out my article, and for the book tip. I will look into this book. Take care. did you ever really ponder “just” this scripture????????……. especially the “body” in “hell” part?????? ?…….i’m gonna write about this one soon,………. I wrote an article, “God and eternal punishment. ” I think the scripture is referring to the fact that, in hell a person is destroyed body and soul. No eternal punishing. oh!!!! 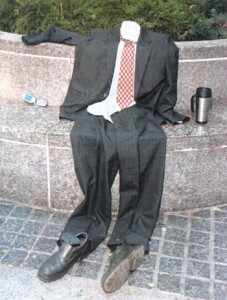 and i dig the picture of the empty suit,…that’s funny……. I happen to believe in pre-tribulation rapture. Based on the salvation of the Hebrews out of Egypt from their task masters by Moses. They were not totally annihilated and God reserved a remnant and saved them by the blood on the door posts. Sure we will suffer persecution but the annihilation will not happen with Christian believers. Jesus will come and rescue those who have applied His blood on their heart. The rapture is a promise not just a minor prediction of theology. We shall be called up. HALLELUJAH. Nice to hear from you, thanks for your comments. It is so wonderful to know that either way we will be with the Lord forever. Take care. Thanks Irv, That was very informative. My fear is that some may see the Anti Christ as the return of out Lord and Savior, because they are convinced they would be raptured first. They may also view the short term, relative peace, he brings, as the beginning of Christ’s 1000 year reign.